Imagine my surprise... to open the newspaper after another hot, sweaty, frustrating weeding session spent trying to keep a particularity aggressive weed from choking out my tomatoes, corn, lettuce, squash, and potatoes, to open the New York Times to see a photograph of this dastardly weed — In the Food section! It seemed that Jean-Georges and Le Cirque were drizzling a little olive oil on this junk and serving it at $12 a plate. Even worse, the article went on to say that a farmer in the very next town to me had ripped out his corn and replaced with purslane because it was "it was a more lucrative crop." No fooling — It's a weed! You don't have to water it, you don't have to fertilize it, and you certainly don't have to weed it. All you have to do is make sure you keep your front door locked so it doesn't come inside and set root in your carpet. Welcome to the world of The $64 Tomato, populated by masochistic groundhogs, apple-stealing squirrels, deer-feeding neighbors, and neighbor-feeding deer. Yet it's also a world inhabited by to-die for tomatoes, apples that recall Thomas Jefferson, and magical moments of digging potatoes with my children, discovering "there's always one more." A Quills Book Award finalist and National Book Festival selection, The $64 Tomato reminds us all, as one reviewer said, that "life Begins in the Garden." But that doesn't mean we can't laugh about it. 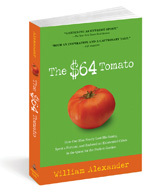 The New York Times goes bananas over The $64 Tomato!